The pair of toucans serve as a focal point for the surrounding vegetation that seem to dwarf the birds. Yet the two birds remind us of how we too need companionship, amid unknowable nature almost painfully exquisite in its beauty. Beyond the forest the sky reminds us of the freedom that birds symbolize. The species represented appears to be the white-throated toucan. This painting is by Wellington C. Marin, December 9, 1998, the medium is gouache on Arches paper. Actual size of the work is 16.5 x 22 inches. 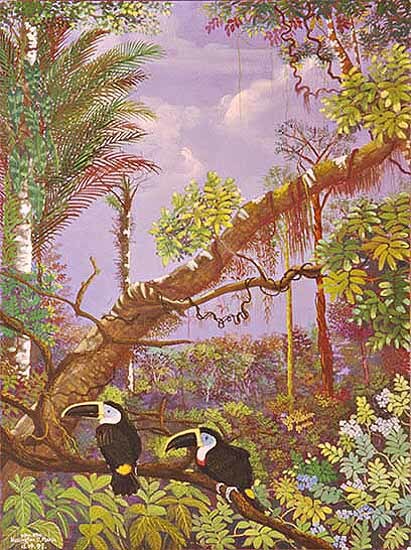 The Tucanes "In this painting we can see on the left side the Shebon leaves. Then there is a white tree with the air plant called elephant ear. In the first level there are two toucanes where it's taking a rest on the branch. To the right side there is a tree called capirona. It has a red color. Then we have chirik sanango. They are medicinal plants with a tasty tonic prepared by shamans by blending the energies and the juices of several plants."